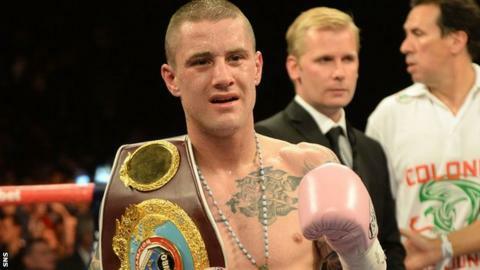 Promoter Eddie Hearn says Ricky Burns will defend his WBO lightweight title against Terence Crawford in February. The unbeaten American will come to fight in Glasgow as Burns attempts the fifth defence of his belt. Hearn tweeted: "Delighted to confirm we have agreed terms with @trboxing for @ricksterko to face @budcrawford402 in Glasgow in February." Coatbridge fighter Burns has not fought since breaking his jaw in a draw with Raymundo Beltran in September. Hearn says that the date will be confirmed soon. Fears had been cast over 30-year-old Burns's boxing future following the match with Mexican challenger Beltran at Glasgow's SECC. Burns's camp said their fighter sustained the injury in the second round, but fought on in a contest Beltran's management and many other observers believed the 32-year-old had won. There were calls for Beltran to be given a re-match, which Burns appeared keen to do. However, the WBO have ordered Burns to fight mandatory challenger Crawford first.